The cycle rickshaw is a small-scale local means of transport; it is also known by a variety of other names such as pedicab, bikecab, cyclo, becak, or trishaw or, simply, rickshaw which also refers to auto rickshaws, and the, now uncommon, rickshaws pulled by a person on foot. Cycle rickshaws are human-powered, a type of tricycle designed to carry passengers in addition to the driver. They are often used on a for hire basis. 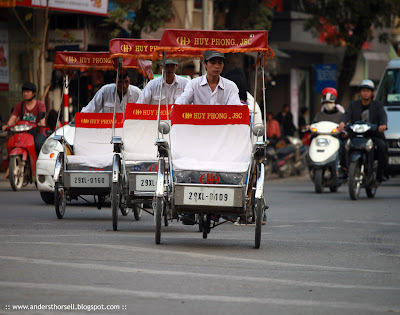 Cycle rickshaws are widely used in major cities around the world, but most commonly in cities of South, Southeast and East Asia.